The final day and official event of BTAC 2017 takes place with the closing interfaith service starting at 11 AM followed by our traditional brunch at Blue Mesa. We've had a record turnout of BTAC attendees, and many of them were first timers. We've had folks come from Alabama to Jamaica We've learned, laughed, networked and loved on each other, and witnessed the passing of the BTIPS crowns to a new king and queen. It's going to be a long 365 days until we're back together again. Happy 82nd Birthday, April Ashley! Today is the 82 birthday of British trans icon and pioneer April Ashley. She has led an amazing life as a Vogue model, received an MBE back in 2012 and was a plaintiff in Corbett v Corbett, a 1970 marriage case that went the wrong way for her and trans folks in Great Britain of which the repercussions of it didn't get cleaned up until the Gender Recognition Act was passed. But by living her life, she inspired others in Great Britain to live as their true selves, and she deserves much credit and praise for that. A film that documented April's visit to her hometown of Liverpool for her 80th birthday to receive an Honour of the City. I've been here with my BTAC family focused on talking to all of my friends and the amazing leaders in the community, so it slipped my mind that that travesty of a presidency we're enduring has now entered its 100th day. This 'Make White America Great Again' exercise in white male fragility and mediocrity has exposed for the whole world to see just how incompetent not only Trump is, but the whole premise of conservative white male leadership. They have to lie, cheat and steal to accomplish anything, and Trump is a sterling example of it. He's only in it for himself and his 1% buddies. It also exposes to the world just how morally bankrupt conservatism is. The cluelessness of the peeps who voted for this clown was brought home to me a few weeks ago when I was hanging out with several cis girlfriends in the Galleria area. We were having a great time at Panera Bread enjoying each others company and minding our own business when this elderly white woman walked yup to our table and inserted herself into our conversation. When she found out I was a blogger , she asked me my opinion of Dear Cheeto Leader, and I let her have it. I called him the worst POTUS of my life since Nixon. decried the racism that got him elected, and pointed out Trump was not qualified for or had the temperament to be president. And then I went back to finishing my meal and conversation with my company that included two college professors and a banker. 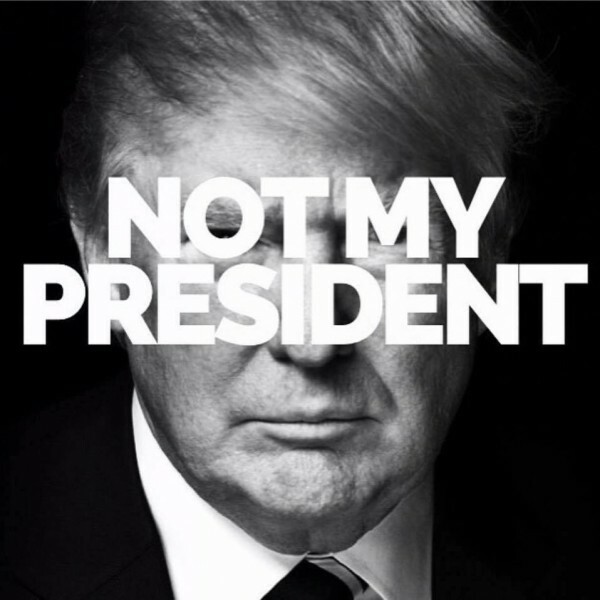 Yeah Bernie or Busters and Stein and Johnson voters in Wisconsin, Michigan, Pennsylvania, Ohio and Florida, I'm still pissed at you for your November 8 decision that greased the skids for this disastrous mispresidency. I'm even more pissed off at all you trans peeps that voted for Orange Julius. Thanks to all the winners who were honored at our awards gala last night. When the sun rises in the Texas sky in a few hours, we'll be bouncing from the host hotel to take part in Black Trans Family Fun Day at the nearby Circle R Ranch in Flower Mound, TX. It's a few hours of fun barbecue and Moni dishing out domino lessors to all who dare to cross her path. Since these peeps are visiting my home state, I'll be nice and won't make them sign the score sheet once I'm finished giving that domino lesson. And yeah, I still chuckle about the trash talking Syria was doing when she and her partner were at an adjacent table playing spades. Once we return from the Circle R Ranch to the hotel, it's Black Diamond Ball time and then we'll probably be hanging out late in lobby or in our rooms as this BTAC 2017 week comes to a close. .
As you loyal TransGriot readers are already aware of, been here in Dallas for the sixth annual Black Trans Advocacy Conference. I sit on the board of BTWI and act as its media chair, so this has basically been a working vacation turned pre birthday week celebration. And I'm enjoying every minute of it seeing my BTAC fam from around the country and increasingly, the world. Had to step into my room for a minute and handle my Shut Up Fool business, so this is going to be a quick one in which I just announce the winner. This week's SUF winners are a group award for the Texas Southern University Board of Regents and TSU's president . The HBCU based in Houston extended a head scratching invitation to speak at their upcoming May 13 convocation to Sen. John Cornyn (R-TX) which is not sitting well with students and faculty on campus. Our senior US senator is a man that is hostile to our community policy wise, has an 'F' score on the NAACP Congressional Report Card, and claimed in 2015 that racial tensions are 'phony narratives'. And you wonder why TSU's 2017 don't want him desecrating their campus. TSU board of regents, shut up fools! Congratulations to our new BTIPS pageant royalty in Mr. Black Transman Trenton Johnson of Dallas and Ms. Black Transwoman Tiffany Starr of Atlanta who were crowned during our pageant last night..
Hey at least we kept one of the titles in Texas. It's Friday, Day 4 of the Black Trans Advocacy Conference, and the featured event for tonight is the Awards Gala hosted by Merrick Moses and Jade Lenore that will start at 7 PM tonight. We also have a 12 noon press conference scheduled to discuss some issues of importance to the Black trans community along with our final day of seminars. Yep peeps, one of the foundation awards being presented tonight is named after me.. The other awards being presented tonight in the foundation category are the Louis Mitchell Empowerment Award, The Kortney Ryan Ziegler Awareness Award, the Kylar Broadus Equality Award and the Lawrence T. Richardson Humanitarian Award. The Black Transmen, Inc. Man of the Year Award and the Black Transwomen, Inc. Woman of the Year Award will also be given out this evening. Congrats to all the award nominees and good luck to you. As y'all loyal TransGriot readers know, I'm 262 miles north on the other end of I-45 for the Black Trans Advocacy Conference handling my BTWI board and conference related business. This was planned before I agreed to run for Houston Pride Parade female Grand Marshal. What I didn't anticipate was all the subsequent political mess of this current 85th Texas Legislative session causing me to spend more time where I was needed in Austin. Tonight at Pearl Bar is the 2017 Houston Pride Kickoff Party that starts at 7:30 PM, and the pride Grand marshals will be announced during it. I'm poised to make a little Houston Pride parade history if they call my name for female Grand Marshal. I would be only the third African American woman after the Rev. Carolyn Mobley (1993) and Fran Watson (2016), the third trans feminine one after Phyllis Frye (2006) and Jenifer Rene Pool (2012) and the first Black trans feminine one ever. If they call Lou Weaver's name as the male grand marshal, he would not only become the first ever trans masculine grand marshal, we would make history together as the first out pair of trans grand marshals serving together at a pride parade in the same parade year. If it happens, yay moi and yay Lou and y'all have some drinks for me. We're passing the halfway mark of the BTAC 2017 conference, and in addition to yours truly doing my part to ensure it is an informative and enjoyable conference for all our attendees, I am enjoying my extended birthday week celebration. It is my fave conference, and increasingly we have people attending from different parts of the world. Our brother Neish is back from Jamaica, Dora is repping Brazil, and Neo is repping The Congo. That perspective is important for those of us African descended people who grew up here in the States, and helps give us visual evidence and proof that we are part of the African Diaspora. One of the other things that takes place during BTAC 2017 that is important is all the networking and information sharing that happens in conversations large and small. The other thing that is also important when we gather at BTAC is seeing old friends, meeting new ones from around the country and the world, and just getting to know people on a personal level you may have only regular connections with previously via Facebook or other social media. There's also meetings with people from other organizations who wish to seriously engage with our Black trans community as we are gathered here in Dallas, and me handling my business as BTAC's Media Chair. My BTAC siblings, like myself are taking time to have some fun. It's not all serious business. BTAC is at a basic level, a big family reunion and one of the few Afrocentric trans themed conferences in the US. It's a time where I get to laugh and get loved on by my trans fam that looks like me and shares my ethnic background. When you have a bunch of Black trans women gathered at a conference, it's gonna be a fashion show. Mama Moni is damned sure ready and able to handle her fashion business in that department with several days of clothes and three pairs of shoes in her two suitcases. I'm also enjoying the fact that in addition the record attendance we are having this year, we have a large contingent of trans women to go along with our trans brothers. We also have a lot of first time BTAC attendees this year, and it makes me pleased and proud to see this happening. You can keep up with the BTAC happenings at the #BTAC2017 hashtag. We also have people doing Facebook Live events and I'm tweeting at my TransGriot Twitter handle when I'm not taking part in an event.. It's Day 3 of the Black Trans Advocacy Conference, after an amazing TransManifest Live! talent show last night and a substantive Black Trans Community Summit conversation . And as you probably guessed, I was busy with a Black Trans Summit panel discussion and a 'Beyond SB 6' one in conjunction with Trans United Fund. I also read two of my poems during TransManifest Live! This year's BTAC keynote luncheon will feature our 2017 speakers Vann Millhouse and Dee Dee Watters at 12 noon CDT. We will also have our State of the Black Trans Union town hall conversation at 2 PM. The featured evening event will be the Mr. and Miss Black Trans International Pageant which for the first time will feature regional winners from different parts of the country competing for the title. Why you hatin' on trans me? Is it because you wanna be? The bathroom that I get to poop and pee? What up with that Texas GOP? We're continuing to gather in Dallas for the 6th annual Black Trans Advocacy Conference, and the first day of i t was a busy one for me. In addition to a radio interview on KERA, I also was asked to take part in the opening interfaith service. and was part of a mazing AYOMBI conversation with my trans sisters from around the country until a little after 10 PM CDT that continued into the early morning hours. And as is the case at any conference , if you see me in the halls, don't be shy, say hi. I'm I'm not involved in the event, I'll also be tweeting and talking about it at the #BTAC2017 hashtag along with my BTAC fam. When the LGBT Media Journalists Convening happened in Philadelphia in 2014, the host hotel for it was right across the street from a trans historical site in Dewey's Lunch Counter. 52 years ago today a successful sit in a protest jumped off by African-American gender variant teens who were told they would be refused service if they were not in gender appropriate attire happened here. This happened a year before Compton's Cafeteria in San Francisco and four years before Stonewall. The Deweys protest was also another instance of a trans themed protest happening in the US and one that we know of with significant African-American involvement. Since 1978 a 24 hour eatery has been open in the former Dewey's space called Little Pete's. I'd eaten there with a strange sense of deja vu not long after I arrived in Philly and got settled into my #LGBTMedia14 hotel room. I spotted it while gazing out the window of my room, was still hungry from my travel day, and just decided to check it out and grab something to eat there since it was close. I was told a few hours later at the opening LGBT Media mixer event by a Philadelphia attendee who knows my love of history that we were across the street from the old Dewey's, and subsequently told all the trans journalists we were right across the street from a trans historical site. During a break in Saturday's LGBT Media programming, all the trans journalists in attendance, myself, Gwen Smith, Dawn Ennis, Gretchen Hammond, Jos Truitt, Cristan Williams and Becky Juro along with NLGJA executive director Adam Pawlus walked across the street to take a photo in front of Little Pete's and pay respects to our sadly unknown elders who participated in that trans humanity centric protest. Well peeps, if you wish to replicate that photo, better do it soon because the sad news I'm hearing is that Little Pete's will be permanently closing next month, Its last day of business will be May 29, and after that it has a date with a wrecking ball to make room for a Hyatt Centric hotel. It's always sad to me when a historic site closes, Here's hoping that someone in the Philly LGBT community will work to have a historical marker placed at that spot where Black trans history was made once the new hotel is completed. My behind is hopefully in bed as you read this instead of running my mouth, but this is what's on the agenda for the first day of BTAC 2017 from our host hotel, the Dallas/Addison Marriott Quorum by the Galleria. So looking forward to Day 1 of the 2017 edition of BTAC. The theme for this year's conference is Loving Ourselves Through Ultimate Service (LOTUS). That's important in a time in which we have a hostile federal government and many of us live in states that are hostile to trans people as well. On the agenda at 1 PM CDT is the BTAC Conference Welcome and Orientation along with the first two sessions of BTAC 2017. At 7 PM the BTAC Interfaith Welcome Interfaith Service takes place followed by at 8:30 PM the AKANNI trans masculine support group meeting, the AYOMBI trans feminine support meeting and a new event this year, the ANCHORS cisgender women's support group. We have always had cis women in our BTAC family who are either dating or married to trans men This year we'll have a conference programming track set up to support them. These women have also been invaluable in terms of breaking down to their trans feminine sisters what it's like and what the societal and community expectations are for being a Black woman as a person who has had to deal with those issues from birth. Those conversations are vital to us building sisterhood not only in the BTAC and BTA ranks, but over time in the Black community as a whole. While I was traveling to Dallas, the Great Day Houston show on KHOU-TV focused on transgender issues happened. I knew it was going to talk place today and was asked to be there for it, but I'd already committed to traveling that day, and my bus was scheduled to leave an hour before I was supposed to be at the KHOU-TV studios. Those studios are also just west of downtown. Oh well, can't be at everything. But the cool thing about being an advocate during this time period i that we have more people stepping up to be voices for our community. Here's the video of the segment of Michael Hughes and Jessica Zyrie discussing the bathroom issue. Moni's In The Middle Of BTAC 2017! I'm finally in my room at the Dallas/Addison Marriott Quorum by the Galleria, and ready to handle my BTAC business here as a board member and the Media chair for Black Transwomen, Inc. This Megabus trip up left Houston 18 minutes late, and we got here to my stop at the DART Downtown Transit Center 20 minutes late. But I forgot that quickly as Rachel Gonzales scooped me up and we killed some time before i headed to the host hotel..
And yes, since I'm treating BTAC as the start of my extended birthday celebration week, I'm going to take a little time to have some fun while I'm here as well. There's a 7 Eleven around the corner in walking distance from the hotel, and they will be seeing me frequently destroying Slurpees this week. Only four away from another free one. I will be taking the time to write and tweet about what's happening here, and as a reminder, you can check out the #BTAC2017 hashtag on Twitter and Facebook to see what everyone's up to. On that note, time to check the hotel lobby again and see who has arrived. Yes, I was just on a Megabus last week headed to Austin on Easter Sunday no less to do battle with the Texas Forces of Trans Intolerance desecrating our state capitol. Now that I've done my part to help fight the attempt to pass the unjust HB 2899, this time I get to do something that is fun for me in terms of getting on a Megabus rolling north on I-45 to go to Dallas for BTAC 2017. The Black Trans Advocacy Conference is not only my favorite conference, it's a unique one in the trans conference ranks. For five days, it's one that unapologetically centers Black trans people and the issues that impact our community while serving as a family reunion style gathering. We also get to inform, educate and network with each other while building that extended family with life changing results. Once you attend BTAC once, you'll never be the same person again. The planning committee enjoys putting it together, and they are shooting for another record attendance year for BTAC. You can also follow the action on social media at the #BTAC2017 hashtag. What will be weighing on our all our minds is Chay Reed, the young trans sister we just lost this weekend in Miami. Here's hoping they catch the waste of DNA who killed her. During this BTAC week that starts today, we'll have the blessing of getting together to make another year of memories, laugh, cry, learn from each other, hug old friends, meet new ones, thank our allies and sponsors for their support and just gather together as a extended family once again. 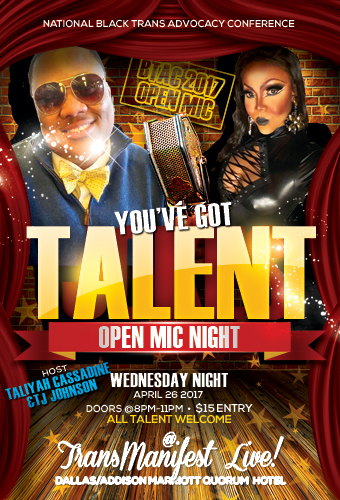 In addition to the BTIPS pageant, the TransManifest Live open mic talent show, the awards gala, the State of the Black Trans Community Town hall and Saturday's Family Fun Day, it's going to be another informative and fun week. Yeah, I spent much of the last few days since I returned from Austin catching up on my sleep since I know I have a few long nights ahead of me. That's before I factor in all the folks in the DFW area who want to see and chat with me while I'm here. . This is the sixth annual incarnation of it, and as a member of the BTWI board, I also get to do my part in helping the convention trains run on time. It's also the kickoff to my extended birthday week celebration. This BTAC 2017 week that we've all in the BTA family impatiently waited for since the close of last year's conference will sadly be complete when we reach Sunday, April 30. And it's still not too late for you to join us. See y'all in a few hours. One of the things I've been pondering in the run up to the start of BTAC 2017 in Dallas is the recent incident with a Black trans woman with a large YouTube media following in TS Madison Hinton having a trainwreck of an interview with a person who misgendered and disrespected trans men by calling them lesbians. Note to that person, trans men are men. That interview justifiably pissed off my trans brothers, and to TS Madison's credit, she wants to clean up the media mess she helped create and have a trans man on her channel who actually knows something about and can expertly talk about being a Black man of trans experience. But that incident drives me to make this point. Our social media platforms, whether they are on blogs or video channels, are powerful informational tools that are not to be played with. When you have a large media following, great responsibility comes with that social media platform, and what you say and how you say it matters. When you put something out there on your social media platforms, especially as a Black trans person, it needs to be accurate and on point.because you don't get to make mistakes. Neither should you be putting alt-facts out there either. Not everyone is qualified to talk about trans issues, especially if you aren't living our trans lives. There are also some folks in Black Trans and SGL World who need basic Trans 101 'ejumacation' themselves. We already have the burden in Black Trans World of overcoming the myth with cis Black people fed by right wing kneegrow sellout preachers cooning it up for white fundie pastors that being trans is a 'white thang'. There's also that myth in LGBTQ World that Black people are 'more homophobic' that needs to die as well. We Black trans peeps are far too often invisible to the media except when they want to cover another Black trans woman being murdered, and still screw it up. That media invisibility is even more pronounced for Black trans men, who get little to no coverage about the issues of importance to them Neither do Black trans kids or their supportive parents. It's rare where we are shown in the media speaking intelligently about TBLGQ politics and other issues beyond the 'tragic transsexual' meme, so when we get those media moments as Black trans people, they are priceless educational opportunities to be used wisely. That also includes our blogs and video platforms. It takes a long time to build them up as credible sources, and it only takes one of two egregiously bad mistakes to ruin the years of hard work put in to get them to that point. We also must remember that some of the peeps we need to educate on what ails the Black trans community are in our own cis Black community. We must also be cognizant of the fact that with this ongoing national Republican push to pass unjust anti-trans laws, some of the legislators who will be voting YES or NO on those unjust bills share our ethnic heritage and are being lobbied by those misguided sellout pastors spouting facts free lies about us. So facts about our Black trans lives matter. Accurate telling of our Black trans stories matter. Factually accurate discussions about our Black trans lives is mandatory, especially when you have a camera or a microphone in your face. It's why we don't need nor should we tolerate any alt-facts about Black trans people in our Black trans community. One of the things that bothers me as a Christian is when our right wing pseudo faith based opposition tries to hide behind Scripture and use it to justify their bigotry and hatred. It is a centuries old tactic for conservatives to try to use the Bible as a shield in their attempts to other and demonize people, and now they are attempting to do so against transgender people. The Southern Baptist denomination made it the official policy of their church in 2014 to hate trans people, following the Roman Catholic Church in doing so. One of the basic commandments of our faith is to love thy neighbor as you love yourself. It's obvious these faux faith based so called 'christians' hate themselves since they are so busy spending their time and hate orgs money bearing false witness against transgender people. God hates injustice and the people who push it. It's even more odious when you pastors are getting paid to push anti-trans hatred for your personal and political gain at trans kids and their parents who unconditionally love them. Hate is not a Texas value, much less a value in our Christian faith tradition. Love is. It is not godly to oppress trans people, and if you pseudo faith bathed oppressors keep pushing that bald faced lie, you will reap what you sow, and the trans folks you are trying to oppress will be standing tall as your efforts to oppress them continue to fail. Black Transwomen, Inc is saddened and angered to hear about the loss of another precious life to anti-trans violence in the person of 28 year old Chayvis Darice 'Chay' Reed of Miami. FL. We at Black Transwomen, Inc express our deepest condolences to Ms. Reed's family and all the people in her all too brief life who loved her. According to a witness a group of people were walking up a sidewalk in the West Little River neighborhood near the intersections of Northwest 27th and Northwest 93rd Streets when one of them ran across Northwest 27th Street at approximately 5 AM EDT. Six or seven shots subsequently rang out according to the witness and that person fell to the ground. The shooter fled the scene and is being sought by Miami-Dade police. The incident was captured by the home surveillance cameras of the witness, and the video is being reviewed by Miami-Dade police detectives. We at BTWI are also upset and angered to note that once again, a deceased Black trans woman has been misgendered and disrespected in the local media. Reed is the ninth trans woman of color murdered in the US in 2017, and the eight African-American trans person killed this year. Out of those eight Black trans women we have lost this year, seven of them are under age 40. Rest in power and peace, Chay. Know that all who love you will not rest until justice is served in this case. We've lost another Black trans woman to anti-trans violence, and as you probably guessed, she was misgendered by the media. The location for the ninth US trans murder this year is Miami, FL and it happened at approximately 5 AM EDT this morning according to a witness. 28 year old Chayvis 'Chay' Darice Reed according to this witness was walking with a group along Northwest 27th Street and Northwest 93rd Street in the West Little River neighborhood. The witness stated that one person ran across the street, six or seven gunshots subsequently rang out and a person fell to the ground. The shooter fled the scene and has not been located at this time. The witness has home surveillance footage which is being reviewed by Miami-Dade police detectives. Chay is the ninth transperson of color killed in 2017, and the eighth Black trans woman this year. Of the eight Black trans women killed this year, sadly seven of them have been under age 40. If I hear of a memorial service for Chay, will pass along those detail as I receive them. Dee Dee Watters will also be hosting a moment of silence in Chay's honor starting at 9 PM CDT this evening on her Facebook page. Rest in power and peace, Chay. Your trans family will not rest until the waste of DNA who killed you is rotting in a jail cell. It's that time of year when I get to hang out for a week in Dallas at this year's edition of the Black Trans Advocacy Conference that runs from April 24-30. It's a unique experience because it's one of the few that unapologetically focuses on the Black trans community with a family reunion feel. That fun for me starts on Monday. But today is Friday, and it's time to call out some fools for their usual shenanigans and idiocy. Let's just jump straight to this week's winner in Jefferson Beauregard Sessions III. our Confederate Attorney General who seems to have a problem with the concept of judicial review. . 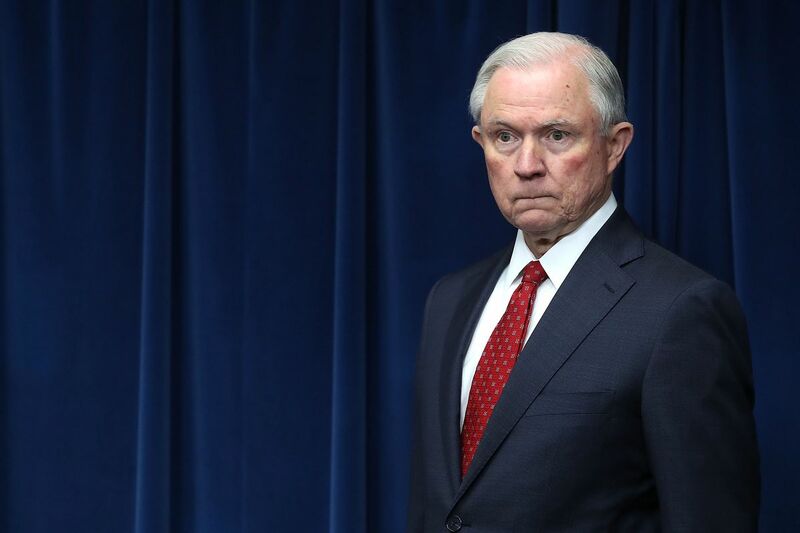 Sessions is 'amazed' that a judge in Hawaii can squash a presidential executive order. But had Jee been paying attention to or even much less reading the Constitution, he wouldn't and shouldn't be surprised about that. But he didn't have any problems with judicial review when it was working to shut down executive orders that POTUS 44 was writing. Coretta was right. You're not only not qualified to be a federal judge, you're unqualified to be Attorney General of the United States. Jefferson Beauregard Sessions III,shut up fool! Since today is the anniversary of the Battle of San Jacinto that led to Texas' independence from Mexico, I thought this would be an apropos day for this post. I have been blessed to travel around much of the US, and much of my France sized home state. I have done the long drive along 1-10 from Houston to LA twice, have visited the LBJ Ranch and his presidential library on the UT campus, and gone to Dallas so much I can drive around it without a map. . It's Selena's hometown and the gateway to another spot I'd love to visit in Padre Island. Would love to see the Selena Museum and some of the other sights of Corpus Christi before zooming across the Queen Isabella Causeway to Padre Island. I was supposed to go there for a high school senior trip but didn't. Even during my airline days I put it on the back burner of places to go see because I now had an expanded list of places and famous beaches to visit. 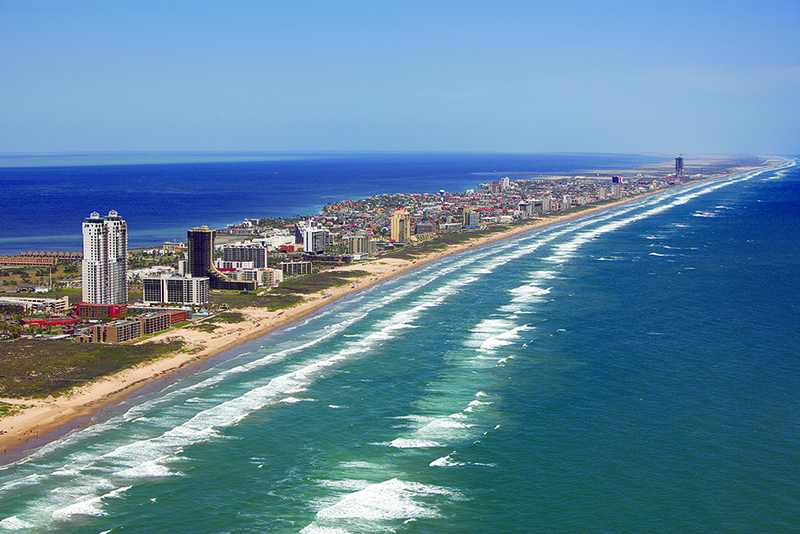 It's also home to Padre Island National Seashore, which protects 70 miles of the 113 mile long barrier island from the development that has turned South Padre Island iato a spring break destination. 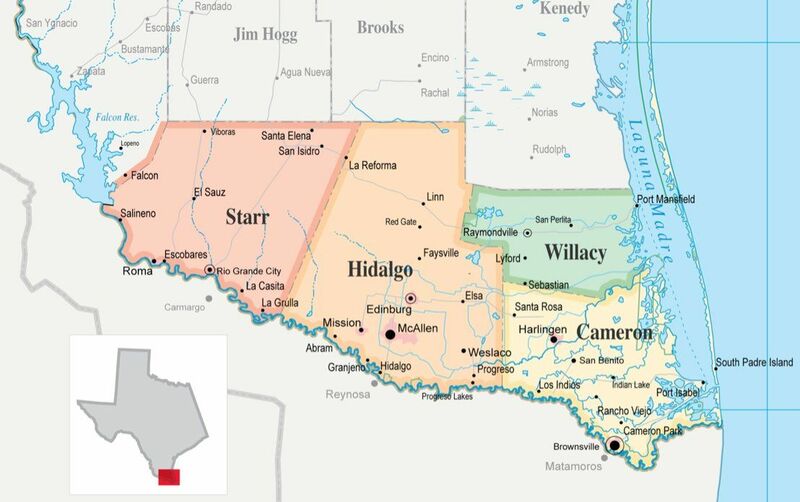 It's considered to be the three counties along the southernmost tip of the Texas-Mexico border, Starr, Hidalgo, and Cameron counties plus Willacy County. Despite having a lot of friends and people I know who grew up there, I've never been to 'The Valley', which is also predominately Latinx. I would love to visit the cities of Harlingen, McAllen, Brownsville and check out its blended culture. They do host a gender conference at UT- Rio Grande Valley, so maybe that will happen for me sooner than I think. While I'm not one of those girls who loves camping out, still have to check out Big Bend National Park and all it has to offer scenery wise. It hugs much of the Texas-Mexico border in West Texas, and because it is sparsely populated and a long way from city lights, it is considered prime territory for star gazing and has the McDonald Observatory nearby. It consists of the northernmost 26 counties in the state and has Amarillo as its major city, connected to Lubbock by I-27. It also has Palo Duro Canyon in the region just south of Amarillo, which is the second largest canyon in the United States . Speaking of Amarillo, which is on I-40 and the fabled Route 66, it has some attractions of its own like the Cadillac Ranch sculpture and the Big Texan restaurant with it's 72 oz steak that free if you can complete its food challenge. While I've driven through it twice in 2006 and stopped to get gas there on my way from Louisville to Dallas for my cousin's wedding, I'd still like to see State Line Drive and the Texarkana City Hall that straddles the border between Texas and Arkansas. In a state that is well known around the world for its barbecue, Lockhart is the mecca for it with four well known spots to pig out on it (pun intended) And yes, this town has been on my radar for some time. There's Smitty's, Kreuz marker, Lockhart BBQ and Black's, and they all have people arguing constantly over which one serves the best barbecue. 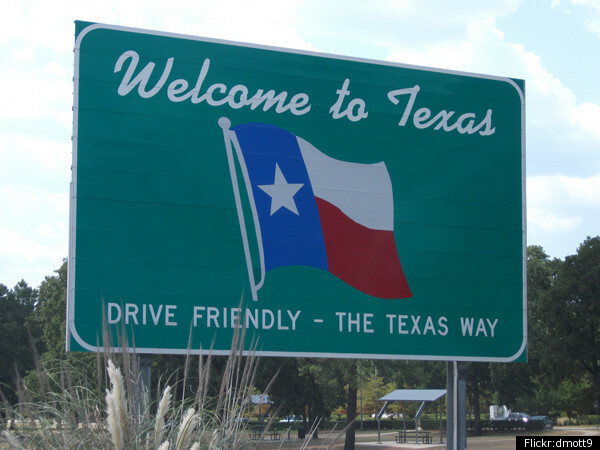 I've been there only once because I tagged along with my godbrother on a drive in 1981, and after Brent finished some TSTC school registration business in Waco, decided to head north on I-35 to visit his then girlfriend at TCU. 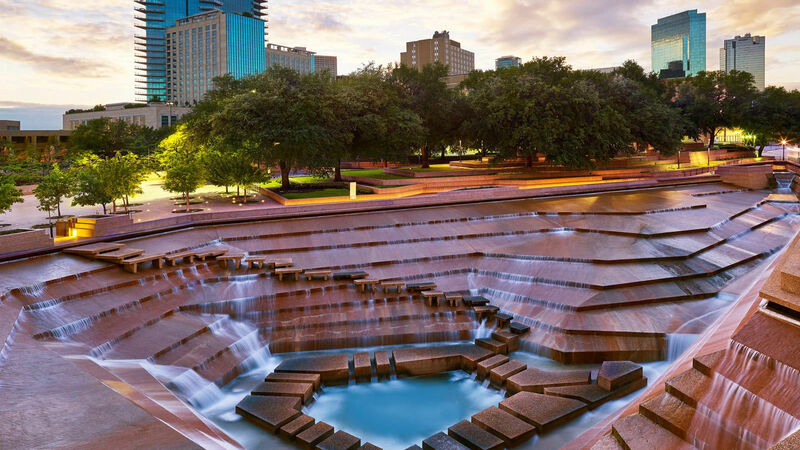 But there's a lot more to visit than the TCU campus, and that includes the Ft. Worth Stockyards, the Water Garden, the Ft Worth Zoo, and Billy Bob's Texas . The home of Baylor University and county seat of McLennan County is another place I haven't visited that does have some things to see besides the campus. The Waco Suspension Bridge that was completed in 1870 and is open to foot traffic only, is on the National Register of Historic Places. It was the first bridge built across the Brazos River, and was used by people driving cattle along the Chisholm Trail. And yes, just east of town was the 1993 Branch Davidian standoff. It's considered the oldest town in Texas, being founded by the Spanish in 1716, two years before San Antonio was founded. It was a long day and a late night for all of us justice loving people who were there from across the state of Texas to register our opposition to the unjust HB 2899. Registration didn't start for oral testimony until 10 AM, but when it did I was one of the first peeps at the computer set up in our hospitality room to sign up to have my say. I was surprised because my name got called a little early in the evening to testify, but once again, being in Austin for the last few days thanks to a major assist from my BTAC fam in Maddox and Rebecca Jackson made that possible. There were 389 people who registered to testify on HB 2899. Of that number, the overwhelming majority of us were in opposition to its passage with only 18 people for it and 2 neutral. And after a day that started for many of us a 7 AM CDT, the hearing finally got cranked up at 11:45 PM and went on until 4:40 AM. This committee was more diverse than the Senate one that couldn't hide their disdain for us a few weeks ago when we Texas trans folks, Mama and Papa Bears and our allies once again bumrushed our state capitol to express our opposition to the unjust SB 2899. House State Affair Chair Rep. Byron Cook (R) was making sure that he ran the proceedings in an evenhanded and fair manner. n between the time I was at the Capitol talking to numerous people, getting my lunchtime Slurpee and wings and contemplating how and what I would say to the committee, I was getting do something I don't get a chance to do back home in Houston:. television interviews. Thanks to Adela Uchida of KEYE-TV (the local CBS outlet) and KXAN-TV along with interviews in the Texas Observer and another local media print outlet, I was getting the message out there that this bill deserved to die and discrimination aimed at any Texan is unacceptable. By the time I finally stepped to the podium somewhere around 12:55 AM, an Anna Julia Cooper quote was echoing in my head before I took a deep breath and handled my human rights business on behalf of my Black trans community and the orgs that I represent. What that Cooper quote, you ask? I got to crash a little after 3 AM because they called my name early, but I went to sleep knowing there were more than 50+ people still waiting to testify and those folks waiting to speak their minds to the committee were overwhelmingly going to be doing so in opposition to the bill. And once again, I got to rep my Texas and hometown Black trans community. As for what happened when the testimony concluded, the committee left the unjust HB 2899 pending, which means they can either call it to a vote or just sit on it until May 29. How about y'all just kill the unjust bill and call it a day? Moni's Made It To Massachusetts! Big Trans Rights Win In Illinois D211! Down Goes UConn in Dallas!